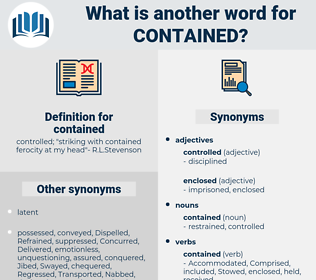 What is another word for contained? projections, screens, media, included, listed, Containing. Consisted, Consisting, Incorporating, constituted, concentration, Indicated, Comprising, Complained, Obtained, Existed, Communicated, encompass, Encompassed, contacted, within, combined, sustained, Contributed, Recommendations, involved, Involving, retained, Comprised, represented, Explained, Caught, documentation, therein, Inserted, confirmed, Contemplated, collected, Introduced, Discriminated, completed, collection, countered, Generated, considered, conveyed, noted, Mentioned, Commented, joined, guaranteed, conducted, accompanied, Abstained, committed, account, Accounted, Counted, suggested, Gained, continued, affected, demonstrated, apportioned, secretary-general, reflected, conferred, Cited, circulated, Enunciated, allocated, regained, applicable, articulated, entail, Entailed, facilitated, presented, coach, coaches, consult, Consulting, concluded, Consigned, appropriated, isolated, Incurred, concerned, concerning, attached, transmitted, described, added, Transported, Enumerated, Tackled, purpose, implied, nominated, stipulate, Stipulated, Attracted, Enacted, outlined, acknowledged, identified, presentation, document, documents, recognised, dedicated, disclosed, evidence, Remained, referenced, come, Came, specified, printed, Created, touched, Achieved, produced, accepted, registered, advertised, informed, Filed, inscribed, report, reported, Reiterated, estimated, Appeared, articles, recognized, Deposited, recovered, elements, processed, reacted, provide, provides, detected, addressed, advanced, possessed, asserted, classified, featured, highlighted, record, recorded, Records, utilized, supported, recommended, lay, Annexed, inside, Submitting, related, Relating, understood, checked, Installed, proclaimed, Caused, taught, echoes, required, announced, exposed, audit, Auditing, Launched, Retaliated, Targeted, Responded, Followed, resolution, nothing, repeated, Lacked, revealed, adopted, attended, treated, Aimed, defined, reside, data, handled, summarized, Allowed, relevant, Embraced, Examined, encounter, Encountered, find, behaviour, Delivered, gathered, expanded, Broadened, advised, Referred, envisage, Brought, donated, draft, enlisted, distributed, Exhibited, exhibits, finalized, secondary, Reimbursed, Carried, Operated, held, pursuant, posed, aroused, invested, edited, applied, Seemed, voiced, granted, approved, Resulted, determined, project, established, Entered, showed, assumed, affirmed, Was, Were, laid, proposed, Quoted, provisions, sent, Reached, Proceeded, Approached, clauses, items, bore, enrolled, focused, focussed, realized, Widened, Harbored, Had, Argued, tabled, linked, Offered, offers, Rendered, placed, used, question, Claimed, cast, Remitted, formed, credited, Ranged, Stood, moved, owned, Became, said, realised, developed, ranked, mandated, briefings, Emerged, Underwent, observed, uttered, Discussed, prepared, Anything, ensured, Gave, Answered, Undertook, agreed, spent, engaged, Supplied, led, sparked, grasped, read, fixed, thought, foresaw, to, wanted, Relied, drove, expressed, called, revised, Lived, Performed, Replied, paid, Rated, stated, felt, Wore, Assessed, how, built, bill, posted, Than, learned, Dealt, Deemed, sets, Acted, Resumed, Meant, Hoped, raised, Behaved, Du, saw, marked, shared, Del, Took, Looked, studied, Asked, kept, Shipped, sought, Returned, Que, gripped, seven, party, requested, formula, put, figured, Went, just, Met, Did, DO, let, What, Ran, Numbered, Got, named, 'il, 'd, She, makes, included, listed, received. 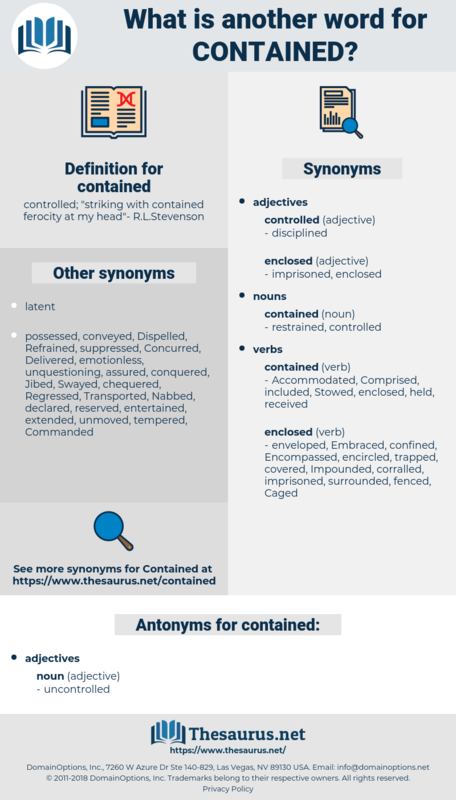 Consisted, incorporated, constrained, contaminated, indicate, Indicated, concentrated, consolidated, Obtained, Existed, Communicated, Encompassed, conditioned, contacted, combined, maintained, sustained, consecrated, restrained, Contributed, information, Accommodated, Contravened, involved, categorized, retained, Comprised, encapsulated, represented, Explained, stopped, Caught, contracted, documentation, Detained, characterized, Inserted, confirmed, Contemplated, collected, Introduced, Replicated, Discriminated, completed, countered, depicted, initiated, Constructed, enclosed, sanctioned, Generated, considered, Collated, declaration, Combated, noted, Mentioned, conserved, transcribed, copied, mainstreamed, associated, joined, accounts, accumulated, guaranteed, conducted, accompanied, committed, Accounted, Duplicated, Counted, implicated, implemented, appointed, Compiled, suggested, pointed, Gained, continued, affected, demonstrated, apportioned, reflected, Administered, illustrated, conferred, Inventoried, Investigated, Cited, circulated, Enunciated, Construed, allocated, regained, stockpiled, Mattered, Regulations, Consulted, composed, Advocated, articulated, Entailed, Denominated, delineated, facilitated, designated, presented, Disseminated, located, concluded, criminalized, Consigned, interpreted, encouraged, appropriated, isolated, Incurred, prohibited, concerned, attached, parliament, regulation, transmitted, described, added, Enumerated, Tackled, absorbed, purpose, implied, nominated, Prevented, Stipulated, Excluded, Enacted, outlined, acknowledged, documented, Justiciable, mitigated, collapsed, imported, monitored, identified, codified, transposed, circumscribed, document, documents, protected, recognised, allotted, evidenced, secretary, dedicated, disclosed, increased, extinguished, c., blocked, CODED, Remained, assigned, referenced, Anchored, withdrawn, authorized, come, specified, Translated, printed, Created, touched, Achieved, tained, Notified, produced, accepted, Transferred, portrayed, showcased, tracked, Propagated, principles, acquired, registered, Mimicked, advertised, Influenced, informed, embodied, Filed, filled, Instituted, recommenced, withheld, Emulated, envisioned, Retrieved, inscribed, report, reported, estimated, government, Appeared, broadcast, opened, extended, recognized, Deposited, recovered, processed, detected, Accorded, directed, Arisen, Deleted, positioned, addressed, elaborated, advanced, derived, written, asserted, classified, featured, regulated, selected, Curtailed, Couched, highlighted, subscribed, accomplished, halted, annex, recorded, Prosecuted, invited, measured, outdated, utilized, recaptured, supported, recommended, overcome, bound, curbed, leakproof, Annexed, detailed, protocol, Appended, related, Echoed, recounted, effected, understood, evoked, checked, entitled, admitted, Caused, taught, resubmitted, restored, Inferred, required, announced, Fought, exposed, reduced, Launched, Targeted, Responded, alleged, authored, Followed, resolution, mediated, repeated, clarified, organized, adopted, Captured, reprinted, attended, treated, Afforded, Aimed, defined, updated, handled, summarized, Exported, Arrived, Allowed, Embraced, Examined, Encountered, arranged, employed, publicized, evaluated, find, Drafted, Delivered, gathered, irreversible, deducted, qualified, advised, endorsed, Referred, welcomed, Managed, failed, governed, safeguarded, Brought, donated, Picked, furnished, distributed, Exhibited, finalized, Espoused, divided, seized, stemmed, stored, Tabulated, verified, Carried, Adduced, summarised, Aggregated, held, pursuant, arrested, posed, guarded, Promoted, invested, edited, trapped, Yielded, suppressed, applied, clustered, Seemed, preserved, voiced, Been, entrenched, granted, amended, devoted, encumbered, approved, determined, established, Entered, assumed, situated, assembled, laid, locked, mastered, supervised, proposed, wrapped, Quoted, Harvested, provisions, perceived, Borne, signed, spread, sent, Reached, delayed, Channelled, Approached, Slated, guided, Demanded, budget, budgeted, enrolled, focused, realized, analyzed, Had, Argued, publicised, tabled, linked, Offered, expended, Rendered, placed, declared, used, Claimed, reissued, loaded, become, cast, Remitted, Upheld, formed, credited, sponsored, shocked, pubished, sealed, moved, owned, briefing, said, realised, developed, Undergone, ranked, Grounded, mandated, Told, permitted, Worded, pronounced, Viewed, Tendered, known, Mobilized, formalized, observed, shaped, revived, harnessed, Undertaken, Discussed, Succeeded, spelled, discharged, left, prepared, ensured, secured, Answered, agreed, restarted, spent, engaged, foreseen, Supplied, Subjected, faced, destined, led, grouped, grasped, read, framework, refined, Devised, fixed, crafted, thought, Logged, mid, tested, played, embedded, suspended, driven, subsumed, Forwarded, renewed, reviewed, resolved, expressed, Disbursed, struck, moot, Mooted, Waived, forced, charged, chosen, called, inclined, drawn, worn, pledged, Performed, Replied, subdued, paid, Lodged, dumped, Rated, reversed, stated, sampled, felt, Expounded, Assessed, replayed, rules, Phrased, built, jammed, pressed, posted, learned, Served, Reaped, reworked, framed, restated, Pooled, Housed, Dealt, Deemed, designed, spoken, Resumed, pursued, Meant, seen, raised, Passed, closed, marked, decided, shared, Dammed, settled, programmed, desired, rebounded, Repaid, Looked, deferred, Bred, fired, brake, studied, Asked, kept, Shipped, Parties, Levelled, vested, sought, Returned, Earmarked, Awarded, party, 2003, Bundled, refunded, requested, Modelled, put, questions, gone, geared, figured, heard, dated, 24, analysed, done, Met, let, Regarded, run, based, Got, -lrb-, named, included, listed, received. This kind of moving chamber contained a bed, a table, and a small chair for the page who wrote or read for him. Then he remembered that among his books was one that probably contained some information about this subject. conodont, commitment, conodonta, casement window, continent, content, condemned, containment, continuant, commandment, come to mind, continued, commandant, Cynthia Moth, contented, continent-wide, continuity, cantonment, conditioned, cynodontia, contaminant, contend, condiment, canned hunt, coconut meat, cynodont, contaminate, contaminated, canned meat, candent, come to hand.